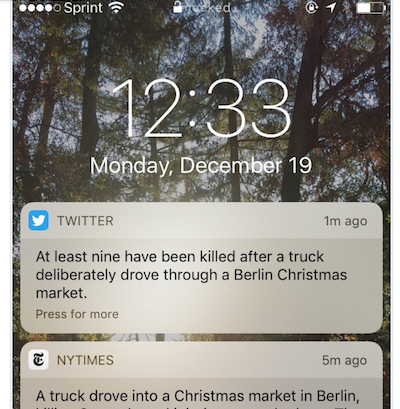 According to a report by BuzzFeed, Twitter has started pushing breaking news notifications to select users, as it did earlier today after a truck crashed into the Berlin Christmas market. Users that linked to Twitter’s Moments tab, which summarizes the news in tweets, received the breaking news alert. The company also sent a similar alert when Fidel Castro died last month. A Twitter spokesperson has confirmed that these alerts are a part of a larger test notifying users about real-time content appearing on the platform. If you’re also receiving these breaking news alerts from Twitter but don’t like them, you can simply head into the settings section of the app and turn the notifications off.